A Tribe Called Us — Anna Akbari, Ph.D.
Sports: love ‘em or hate ‘em, they’re a huge part of our culture. But what you may not also realize is they are part of what makes us human. In The Social Conquest of Earth, Edward O. Wilson argues that tribalism (and competition) is fundamental to humanity, and he describes sports teams as our modern day tribes: “People must have a tribe. It gives them a name in addition to their own and social meaning in a chaotic world.” Though we largely don’t engage in tribal warfare on a daily basis as we once did, we satiate this need on the athletic battlefield – an area that still allows us to demonstrate the superiority of our tribe over another. We feel this surge not only when we’re immediately part of the action, but also when our team rises to victory. So how do we visually mark our tribal sports affiliations? 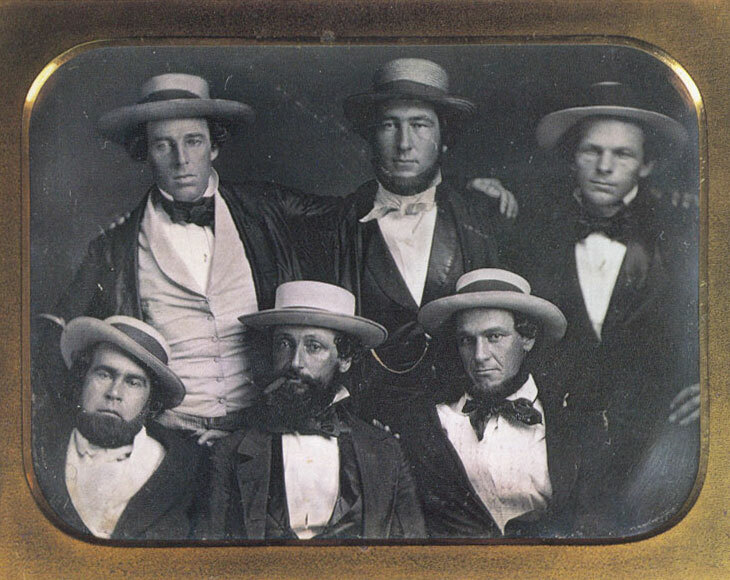 In 1849, the Knickerbocker Baseball club (the first baseball club) created baseball uniforms, and donned straw hats, blue pantaloons, and white flannel shirts (pictured above). One year later, the sewing machine was patented, which allowed the baseball “jersey” to become widespread. Other teams followed suit, creating color schemes and pantaloons of their own. Clearly, the uniform has greatly evolved beyond pantaloons and straw hats. Today, all sports jerseys are uniform (pun intended). 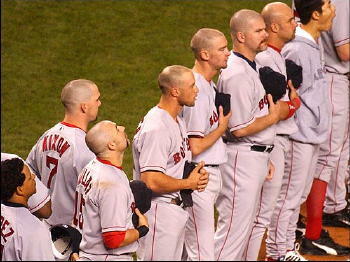 Each team wears identical garb, differentiated only by their name and number. In addition to the practical reasoning for athletic uniforms (easily identifying your team members), these uniforms foster a group mentality, which helps them to function as a unit – an essential quality of any victorious tribe. Temporary tattoos and nail art are a subtle, personalized way to show enthusiasm and lend your team support. Instead of dressing like the mascot or painting your chest, DIY your favorite team jersey for a more tasteful and creative way of individualizing your super fandom. Add studs, jewels, or patches to your favorite sportswear to make it your own. Want to show your support for something other than sports? Join a tribe or make your own with the Human Tribe Project – get your “tribe tags” and rally around a cause, your family, or a friend – or just remind yourself that we’re all part of the human tribe with this t-shirt.